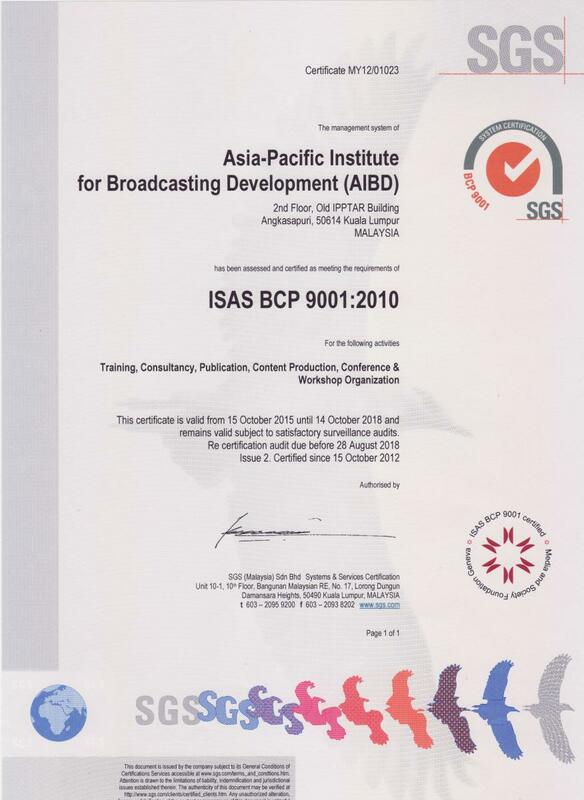 The Asia-Pacific Institute for Broadcasting Development (AIBD), established in 1977 under the auspices of UNESCO, is a unique regional inter-governmental organisation servicing countries of the United Nations Economic and Social Commission for Asia and the Pacific (UN-ESCAP) in the field of electronic media development. It is hosted by the Government of Malaysia and the secretariat is located in Kuala Lumpur. The AIBD is mandated to achieve a vibrant and cohesive electronic media environment in the Asia-Pacific region through policy and resource development. The Institute seeks to fulfill this mandate by mobilizing the intellectual and technological resources available within the national broadcasting organizations of its member countries as well as regional and international bodies through a well-established infrastructure and networking mechanism which includes government agencies, non-governmental organizations, institutions of higher learning, private sector and individual professionals. The International Telecommunication Union (ITU), the United Nations Development Programme (UNDP), and the United Nations Educational, Scientific and Cultural Organisation (UNESCO) are founding organisations of the Institute and they are non-voting members of the General Conference. The Asia-Pacific Broadcasting Union (ABU) is a founding organisation of the Institute and is a non-voting member of the General Conference. Full membership of the AIBD is confined to sovereign states and they are invited to designate the broadcasting authority of the country to be the beneficiary. The AIBD currently has 26 Full Members (countries), represented by 34 organisations, and 67 Affiliate Members (organisations) with a total membership of 101 representing 48 countries and regions and over 50 partners in Asia, Pacific, Europe, Africa, Arab States and North America. The paramount aim of the Institute is to achieve a vibrant and cohesive electronic media environment in the Asia Pacific region through policy and resource development. Assist member countries with electronic media consultancy. The window for regional policy makers to access information to worldwide mass media policy formulation and regulations and vice versa. A vehicle to establish inter-regional links and cooperation for media and communications development. A think-tank for the development of regional programming that reflects the traditional values of the Asia-Pacific region. An agent of change in the regional IT environment. A catalyst for national media development, taking account of new partnerships between manufacturers, service providers and the governments. A media consultancy resource house to assist member countries. A reference centre and provider for human resource development. With the aim of making AIBD play a more assertive role as a regional platform to encourage dialogue and cooperation in the electronic media policy of the Asia-Pacific region, especially with the changing digital media landscape, AIBD has mapped out the Five Year Strategic Plan 2012-2016. The new Strategic Plan can be summed up in one word: "IDEA". "I” stands for Interests. To serve the best interests of our members and make the areas of cooperation larger to achieve a vibrant and cohesive electronic media environment in the Asia-Pacific region. "D" stands for Dialogue. To step up dialogue at all levels, especially through the Asia Media Summit. "E" stands for Exploration. To explore new areas of cooperation, not least by identifying projects in new media areas such as digital broadcasting to adapt to the developmental needs of our members. "A" stands for Accommodation. To enhance mutual understanding and respect and accommodate each other's concerns and culture. AIBD will undertake more initiatives to address the changes reshaping electronic media and the information and communication industries within and outside the region, among them, under-funding of public service broadcasting, commodification of news and information and commercialization of new information and communication technologies. It will pursue progressive media and information policies that stress accountability of various media systems and provide diversity of views. AIBD will also conduct more programmes on how media can deal with social development issues such as poverty alleviation, HIV & AIDS, Cultural Diversity, good governance, ethnic and cultural conflicts and the empowerment of women, cultural minorities and disadvantaged groups through ICTs.